The Teaching Tree Carnival stems from K Raheja Corp’s Teaching Tree initiative where students will be participating in a one-day event at Mindspace’s Central Recreation Garden - CRG on January 20th. This open-to-public event will showcase the handmade artwork of students, which will also reach out to a captive audience of over 60,000 people working at Mindspace. The carnival will see interactive stalls explaining the work of various projects undertaken by students who have been enthusiastically creative and consistent about art and craft. 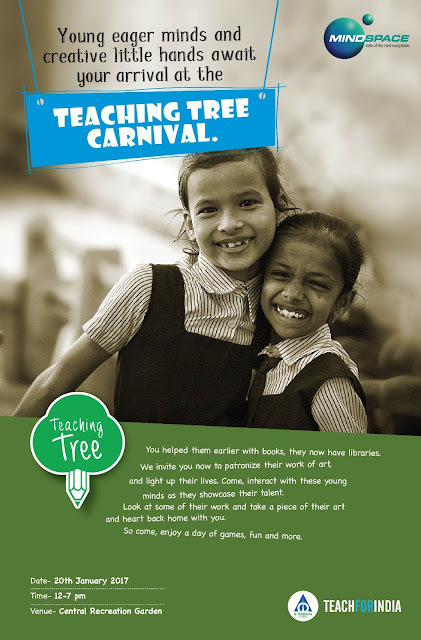 The Teaching Tree Initiative in conjunction with NGO Teach for India have given the students a fantastic platform like the Teaching Tree Carnival to showcase their talent and garner support from corporates who can support their talent and passion. The Teaching Tree Carnival will play host to various stalls, showcasing handmade trinkets including bangles, earrings, bracelets and more. Origami products such as flower sticks, star hangings, snowflakes and many others made by students will be on display. A stall under the name of NutriKare will sell homemade chocolates made by these students. There will be stalls with decorative materials, stationary products and others as well. 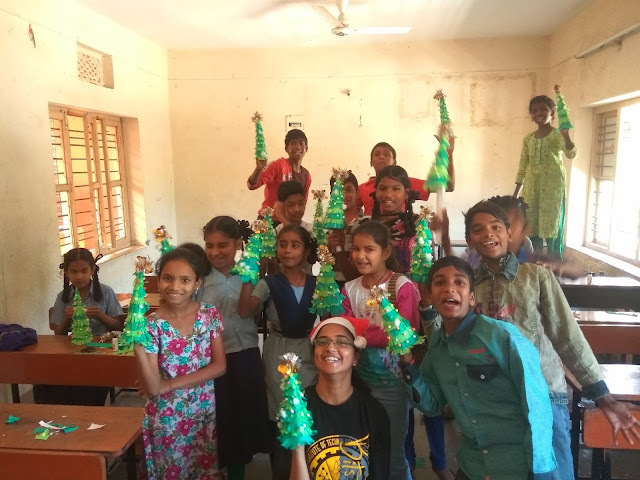 The art and crafts became an integral part of learning in the schools, to equip them further to address challenges they face in their everyday lives. For instance, a fellow (teacher) Praveen observed the inconvenience of students to carry their books and found the need in creating bags from the unused material. He picked the old T-shirts to teach the students to make bags. Students have mastered the art to create these handmade bags, and will sell these bags in one of the stalls at the Carnival. A live arts workshop stall will have students create artwork, prepare bookmarks, learn the art of origami and craft wax products. The workshop will be open to attendees/employees, who will be involved in the process and in creating the final product. Interactive stalls comprises of Need for Speed Challenge, LanTurn Project, 3 characters and a story where students will engage with the K Raheja Corp’s Mindspace employees. In the ‘Genesis challenge’ a form of material will be given to the participant, using this they need to create something unique in a stipulated time. The LanTurn Project is a stall displaying 20 photographs clicked by students at various locations. The students will explain the essence of the image captured and give their perspective on why they chose to capture it. 3 Characters and a story is a fun and intellectual stall that can test the student’s ability to logically connect to the characters suggested by an employee and develop a story in just minutes. For instance if the characters mentioned are bird, window and sun; students will narrate a story revolving around these three characters in two minutes to the employees. It will be interesting to see how they weave a story in a short frame of time. Yousuf’s family makes handbags, wallets, pillow covers and some dresses to sell every Tuesday at the Mandi (market) that is put up in Patigadda. He tends to miss school every Tuesday to help his mom at the Mandi, whilst his father goes to sell the same items at other places in the city. His teacher Milind Chandwani coaxes Yousuf to attend Tuesday classes, since learning is important too and takes extra sessions every Saturday and Sunday to foster his mental growth. With 12 other kids, Yousuf has been paired up with the most determined kids from the class and he's improving by the day, but his interest still lies partially in creating the artistic stuff that his parents have taught him. In order to foster his interest in art, Milind allows Yousuf to attend all the camps (Camp Diaries) and ensures that he learns more art whilst keeping his promise of getting better at Academics. Through the Mindspace Mela, Yousuf has a platform to display handmade products and showcase his artistic talent. With employees from Mindspace attending this event, Yousuf has an opportunity to garner support from them and possibly nurture his talent. Khaja, a Grade 6 student, wakes up every day at 5am to fill water, because if he doesn't he will have to miss out on the extra morning class that his teachers take daily before school. He then helps his grandmother to cook as both his parents leave for work at 6 am to make the ends meet. Khaja wants to be a doctor but his parents unaware of the importance of education, sent him to an Urdu medium school (Madarsa) until Grade 5. Khaja's grandmother on finding out about Teach for India and fought with the whole family to get him admitted into the school. The joy on his face was apparent when his teachers did various activities to explain the simplest of concepts of Math, Science and Social studies. There were various camps for extra-curricular activities organized with activities such as, Dance, Beat Boxing, Drama, Art, etc; Khaja, through these camps, started to love Art and Dancing and has taken to performing in a big way. He has made a tremendous improvement not only in his academics and now leads the other kids in the class to reach their potential. For him the Mindspace Mela is a fantastic platform to showcase his multi-talented self, giving him a chance to speak with the Mindspace employees and share his ideas and plans.